ARGENTINA is going through a rough patch at the moment, its is facing repayment issues over its US$1.3 billion debt to largely US bondholders. Matters came to a head last week when a United States Supreme Court ruled in favour of bondholders; and that Argentina had to pay up, forthwith! This apparent final call for the Argentinians to cough up now has come after this proud nation defaulted on its debts in 2001. After waiting for more than a decade, the lenders said na mas! Some of the lenders agreed to a 'haircut' – accepting the fact that half a loaf is better than none. However, some hedge funds refused to swallow bitter medicine – they lent with the intention of making profits, and not with some midplaced pro bono idea of welfarism. They were the ones who ran to the courts to ask for full payment. These were investors who held more than 92% of the debt held in default; some of whom decided to write off two thirds of their pre-crisis value. This was intended to allow Argentina to rebuild the economy. Problem is, the Argentinian recovery sputtered and its coffers are rather dry at the moment. The nation's president Cristina Fernandez de Kirchner even appeared on television to plead poverty. Talk about airing dirty linen in public! There was further jitters on Wall Street when a senior minister followed this up with a firm; "...we have no plans to go to New York to even discuss the matter of payment." Perhaps the reluctance to address the issue, or making the trip up north to New York had something to do with the altogether different fortunes the Argentinians have created for themselves in Brazil. After getting their second full points from their match, this time against Iran on Saturday, they top their Group table and can make plans to move forward to the next round of 16. Hero for the Argentinians again was none other than pocket rocket Lionel Messi. Ever the prima donna on the pitch, he timed his contribution just as the result started to peter out to a draw to strike a sword deep into the hearts of the opponent. He received the ball some 10 meters past the half way line on the right flank, drifted inside, shrugged off some passive Persian defending and let fly with a left-footed strike against the despairing dive of the hapless Iranian keeper. His manager Alejandro Sabella waxed lyrical about his star player’s contribution – saying even two goalkeepers could not have stopped the rocket delivered from Messi's boot. As for Iran, their exertion; despite the loss; was deeply appreciated by its number one fan – President of the Shiite nation Hassan Rouhani. If you thought the entire Persian cabinet is quite unmoved by earthly diversions; then his presidential interest should put that misconception to rest. "The passionate youth of the Islamic Iran have shown their determination and capabilities to the world again," read a statement he issued following the game. Of note is the word; ...again. I discount matters political – I certainly think he was referring solely on Iran’s display of soccer prowess on the world stage. It may have had the misfortune of drawing attention to itself for all the wrong political reasons but its footballing exploits are on par with some of the more established nations. 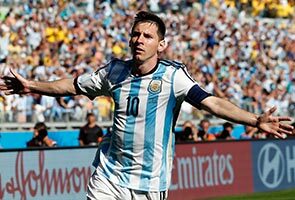 Indeed, Iran had a few chances to equalise against Argentina and the result could have been all too different had their efforts at goal found its mark. The Germans too booked their spot to the next round with a 2 -2 draw against Ghana. The German hero was Miroslav Klose and his exploits simply illustrate that old is bold, old is gold. At 36, only the German team manager is older. There was just 19 minutes left of play when he was brought on. His goal celebrations of a forward somersault may not rival the cartwheel or back-flip of others more uninhited, but energetically acrobatic nonetheless. Interestingly - his first name Miroslav reveals his Polish roots – Klose’s parents fled to Germany to escape Communist rule when he was 10 and knew only two words of German – ja and nein! Thanks to football, his now is on par with Die Bomber – Gerd Muller who starred for Germany in the World Cups of 1970 and 1974. Indeed, he has 15 goals compared to Muller’s 14. Klose now stands level with Brazil’s Ronaldo (remember him, too fat some say to be a player of any use, but look at how the critics had to eat humble pie) for the most goals scored in their World Cup Finals tournament career. With all the accolades showered on the teams that have progressed, spare a thought on Bosnia-Herzegovina. They lost by a mere goal in their two outings. The first to Argentina (to a Messi goal, naturally) and on Saturday, to Nigeria. Their star striker Edin Dzeko can justifiably feel hard done by. His 'goal' should have stood, with television replays showing no one on his team was off-side when he slotted home the ball. Nigeria’s Peter Odemwingie’s 29th minute strike stood till the end and World Cup debutant Bosnia-Hezegovina can make arrangements to head for home. FIFA, the game’s governing body has introduced a couple of innovations to rule out 'injustices', which deprive teams of perfectly legitimate goals. Goal line technology and the vanishing paint has been deployed to great effect. Now if only the linesmen could get some form of optical aid. Lebih 380,000 orang undi siapa terhebat sepanjang zaman: Messi atau Ronaldo?